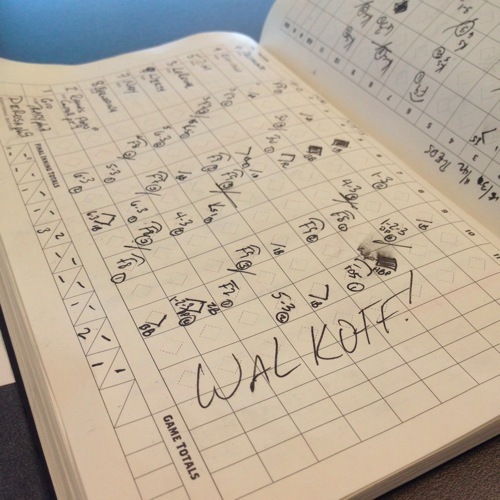 The Nationals won in extra innings today, notching a 3-2 victory over the Cincinnati Reds in ten innings. Craig Stammen picked up his first win of the season, and Alfredo Simon for the Reds picked up the loss on a wild pitch that scored Ryan Zimmerman with two outs in the bottom of the 10th. The home opener is a beautiful thing. You know you’re going to get a primed crowd, you hope you’re going to get good weather, and just about everyone is happy to be there and full of hopes for the team. 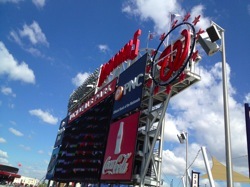 The Nationals had all of that going for them when stepped on the field amid the screams of F-18s overhead and a brass band playing in the infield. The last strains of the National Anthem shredded by so much jet noise, the Nationals took the field with high hopes off a 4-2 road trip and sitting atop the NL East early in the season. On the mound for them, Gio Gonzalez, whose last outing had at least one member of the press corps wondering if he might not be the biggest question mar of the season. Gonzalez answered that question early and often as he scattered two hits from the Reds, and recorded seven strikeouts in seven scoreless innings. Gio’s pitch-mixing was a success today, as the same arm speed that sends a mid-90s fastball was sending mid-80s sinking curves for devastating effect. Having the same arm speed for two very different pitches can really fool the batters, and that’s exactly what happened to the Reds lineup today. After botching a chance to score in the 9th, the Nationals headed to extra innings with Craig Stammen on the mound. Stammen continued the tradition of dominance from the bullpen (Brad Lidge, excepted) and struck out the Reds in order on just 10 pitches, 9 for strikes. Stammen was swift and commanding from the mound – traits that have been lacking in previous seasons – I was pleased to see him make the team this year. In the bottom of the tenth, the Nationals sent Ryan Zimmerman (0-4) to the plate to start the inning, and the chance for Zimmerman to put the game away was lost on no one. He was hit with the first pitch from Alfredo Simon, putting the cold water on that theory right quick. Jason Werth (2-5) would single him to second, and both would advance on a dribbling ground out from Xavier Nady. Roger Bernadina (0-4) stood in against Simon, and with a 1-1 count, Simon would rocket one in, low and outside that would get away from Reds catcher Mesoraco and send Zimmerman charging down toward home. The toss from Mesoraco to Simon would not be in time to catch Zimmerman, and the Nats walked off victorious. At 5-2, the Nationals sit a half game ahead of the Mets in sole possession of the NL East’s top spot. Tomorrow, they face off with the Reds at 7:05pm, with Jordan Zimmermann facing Bronson Arroyo.